Oh, I love onion rings. I love them so much that I used to limit myself to eating them once per quarter, so I wouldn’t eat them all the time. I figured once every three months was good, because if I cheated, I’d still only be eating onion rings twice in a 90-day period. If my goal was monthly and I cheated, I’d be eating them every two weeks, which, when you come to something that has 900 calories and 50 fat grams, is a lot. Now I eat them about once every six months and spend the other 5 months and 29 days convincing myself that they aren’t that great, anyway. I found something that makes me miss onion rings considerably less. They’re almost as addictive and far less caloric. Laura would have said the instructions begin “First, you take a leek…” (read it aloud). BadaBUM. Take three or four leeks. 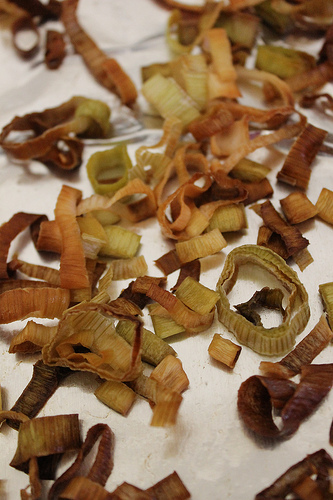 Cut off the roots and most of the green, depending on how much you can stand to waste. Cut the remaining part into round slices about 1/4 inch thick. 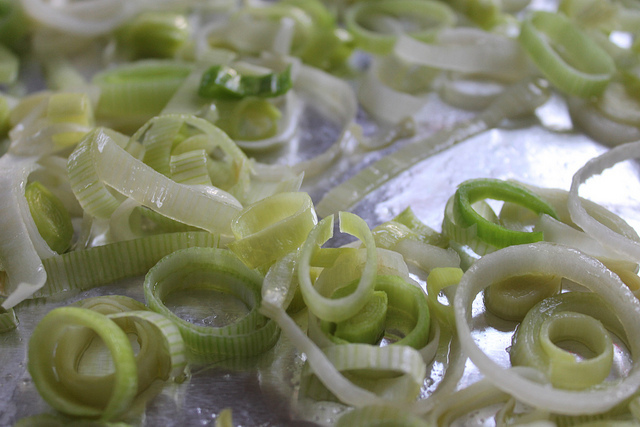 Put these all in a bowl or the basket of your salad spinner, fill with water, and separate the leek rings my pushing the middles up until all the rings come apart (don’t worry about the tiny ones in the middle, those can stay together). Drain the rings, dry them a bit with a dishtowel. Toss with olive oil or mild-flavored veg oil. Spread them out in one layer on a baking sheet and stick them in the oven at 250 degrees. Stir them every 10 minutes or so. They’re done when they’re light brown and crispy. YUM. Tiny baby non-deep-fried onion rings. Eat them today, with Beano so you don’t blow the roof off the house. They’re addictive and crunchy. You can also put them on top of your green bean casserole or on salad or what have you. These are a tiny bit overdone. Still good though. Oh yum! And beano — it is my friend. I buy Beano in the 100-tablet bottles. My love for vegetables demands it. They are good, but fleeting. They start to get soft again after a day or so.